While London fashion week was a dynamic start to the fashion month with its conventional yet edgy fashion rendering, Milan was all about fierce drama. And then we had the Paris bit of it. Everyone was agape in awe as they attended and saw magic unfold on the runway of the Paris Fashion Week A/W’19. There was an amalgamation of all necessary ingredients meant to strike sartorial brilliance. There was drama, there was the ordinary – the consumer friendly couture, there was experimentation, and there were emotional moments. Well, to bring you relief and save you from all the googling, I list down the most exceptional looks from the concluding fashion week! A model presents a creation from the Fall/Winter 2019/20 Women collection by Yves Saint Laurent during the Paris Fashion Week, in Paris, France, 26 February 2019. The presentation of the Women collections runs from 25 February to 05 March. The ramp first saw a series of looks that fall in the realm of very, very Anthony Vaccarello – statement shoulders, animal prints, and mini-skirts. As the end neared, though, the true glimmer of Saint Laurent surfaced and took the show by a storm. The lights dimmed to pitch black and models began walking runway clad in neon couture. Some glow-in-the-dark corporate suits, some little dresses, some statement elements, and a lot of spunky glamour. Miu Miu had a lot to offer to the fashion folks, but what spoke to me the most was the sheer dress worn eccentrically. 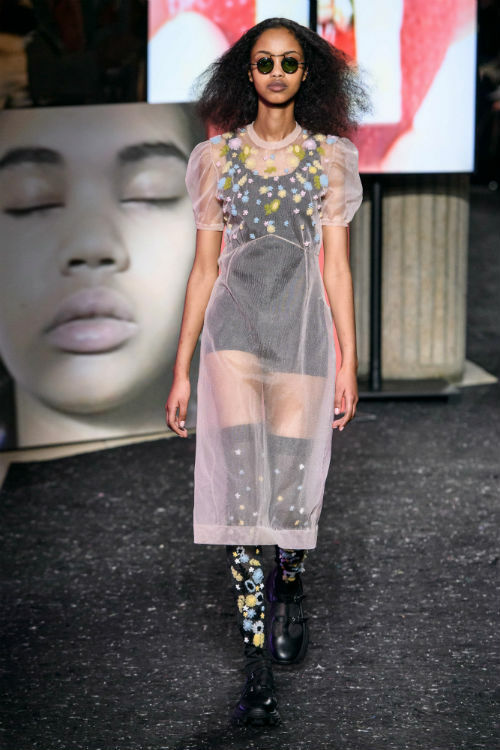 Soon to surface in the fall this year again after months of disappearance, the sheer dress is an amicable hug to us consumers because hey, this is a fashion week piece that can actually go from the runway to your wardrobe. The floral embroidery on the see-through canvas is fit for the fall. Moreover, the embroidered knee-high boots flashing beneath the sheer silhouette make for a powerful statement. Mostly tailored pieces and some undone silhouettes was what defined the Chloe collection on the ramp. However, what struck me and most of the spectators for that matter are the all dark-denim ensembles. 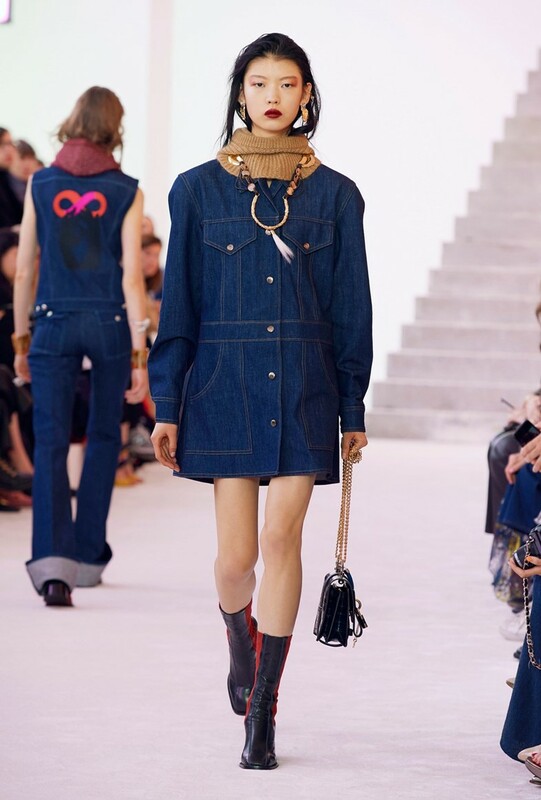 Equally cool and equally nerdy, the denim co-ords and denim dresses certainly brought a dash of utilitarian at the show. Eyes were numb and reverence was in the air as models walked the ramp wearing Karl Lagerfeld’s last creation. Lot of tweed and houndstooth co-ords were seen on the runway. And to say that these houndstooth trousers aren’t on everyone’s fall fashion list by now would be a lie. Wearing the essence of Lagerfeld’s style sensibilities, these pieces radiated pure magic at the show. Finally, concluding the fashion month was this evidently hit Paris Fashion Week A/W’19! Augmented by the emotional moments during the Chanel showcase and glorified by all the all-power fashion dynamics by various designers, it was a success in every way. Now, let’s sit back and watch how modish the fall fashion gets when the time actually comes, shall we? The Paris Fashion Week seems to be have been a spectacular affair. But I guess the showstopper moment must have been the models walking the ramp in Karl Lagerfeld’s last creation. What a poignant moment that must have been. Those are some stunning designs. I love the glow in the dark and houndstooth the best.